The Cimarron Lodge is a large complex located at the base of Lift #7, the Coonskin Lift, making it an ideal location for winter enthusiasts. The San Miguel River also runs adjacent to the complex for easy access to the river trail. 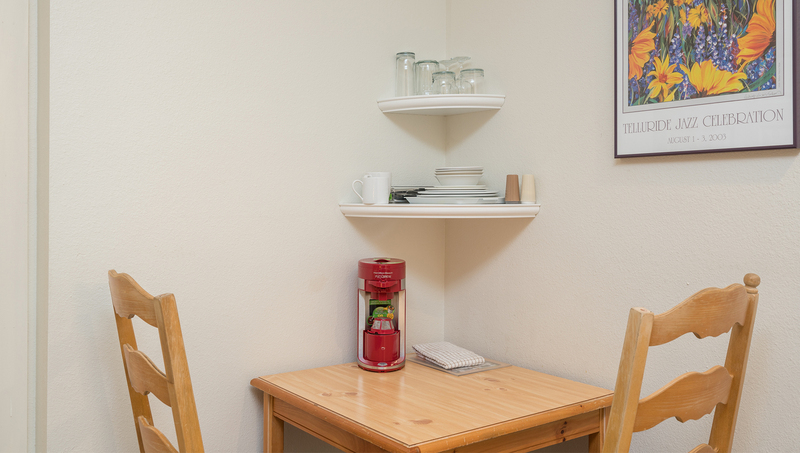 The Cimarron Lodge also has a complex garage and common laundry facilities. 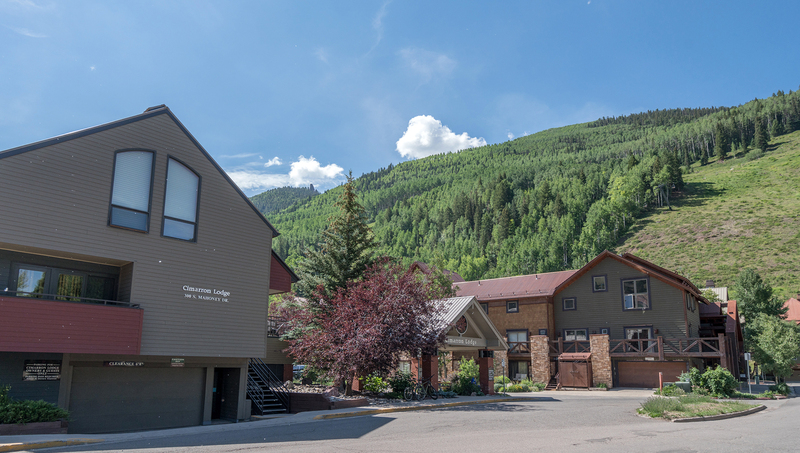 A Galloping Goose shuttle stop is right outside making it easy to get into the downtown area of Telluride. 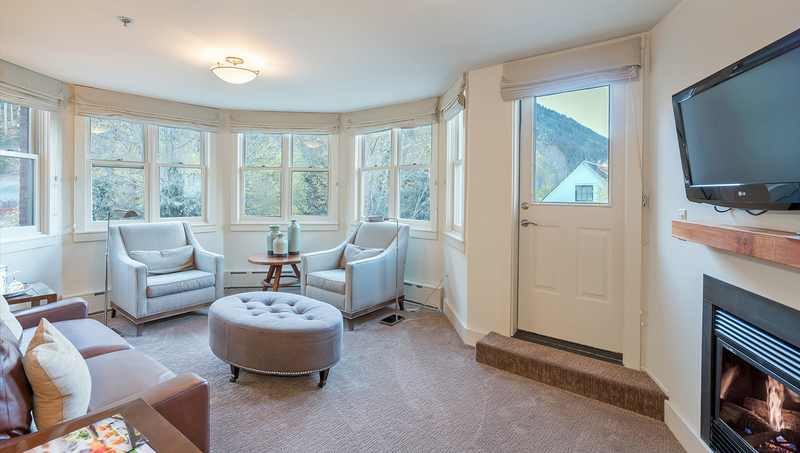 â€¢ Separate, small seating area in sunroom, great place to curl up and read a book! â€¢ Lovely mix of cowboy western, Asian Native Indian and Asian Indian decor and furniture with Pendleton blanket, authentic Navajo rugs. Unique ski-in/out hotel room in Telluride. 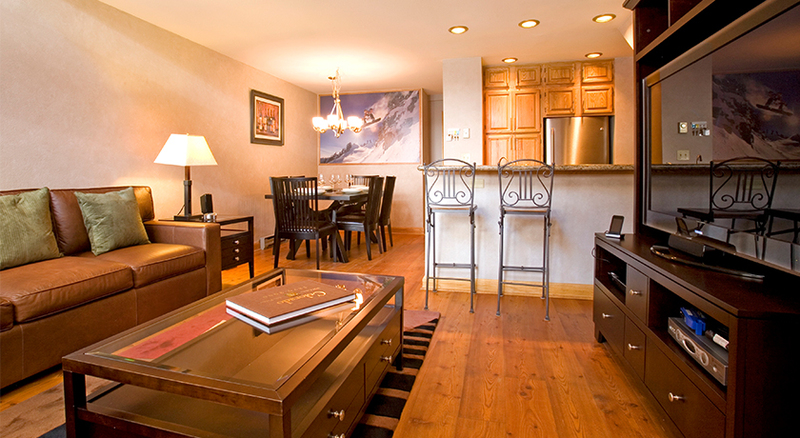 The Cimarron Lodge hotel rooms offer ski-in/ski-out convenience for hotel room rates. You enter the hotel room from the ground floor. Inside there is a king bed that can be made into two twins, a TV w/VCR, microwave and mini-fridge. The bathroom has a shower/tub combo. The Cimarron Lodge has two common outdoor hot tubs. A parking permit will be provided for one vehicle in the Shandoka parking lot on a first come, first serve basis. Additional parking is available at the Mountain Village Gondola Parking Garage, located behind town hall, for $25 per night. Additional parking is available in the Heritage Parking Garage located off Mountain Village Blvd and across for the Hotel Madeline for $35 per 24 hour period. 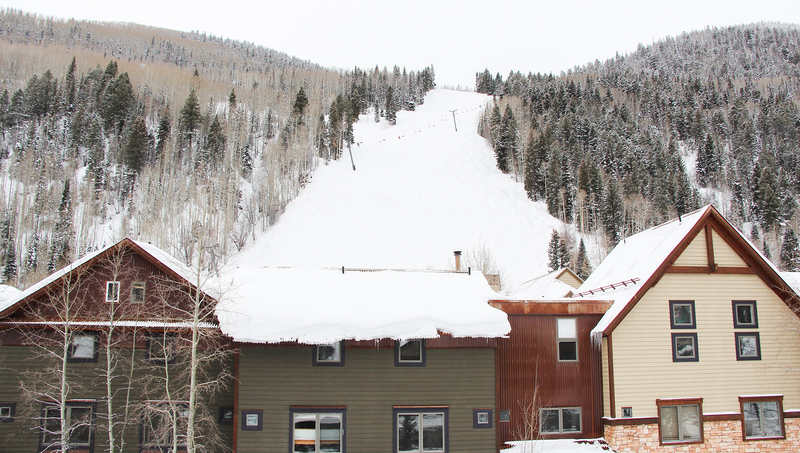 The Cimarron Lodge rooms offer ski-in/ski-out convenience for hotel room rates. You enter the hotel room from the ground floor. Inside there is a king bed that can be made into two twins, a TV w/VCR, microwave and mini-fridge. The bathroom has a shower/tub combo. The Cimarron Lodge has two common outdoor hot tubs. 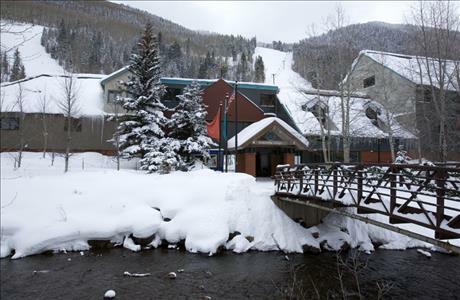 Ski in/Ski out at the base of lift 7 and sitting right beside the San Miguel River, Cimarron Lodge couldn't have a better location. 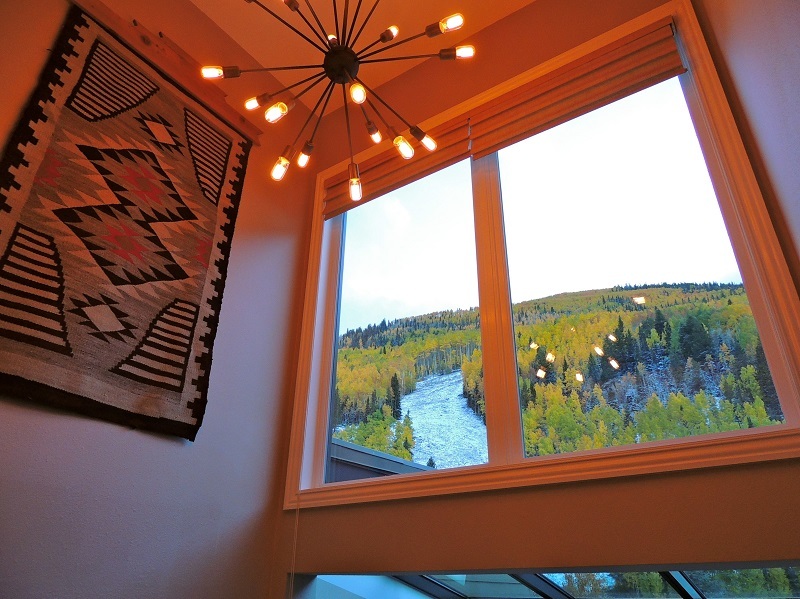 Your private balcony offers incredible views of the snow capped peaks. Bedding: Queen, 2 twins, split king bed, queen sofa sleeper. Enter the condo from the 2nd floor outdoor walkway, and there are 2 levels to the condo. 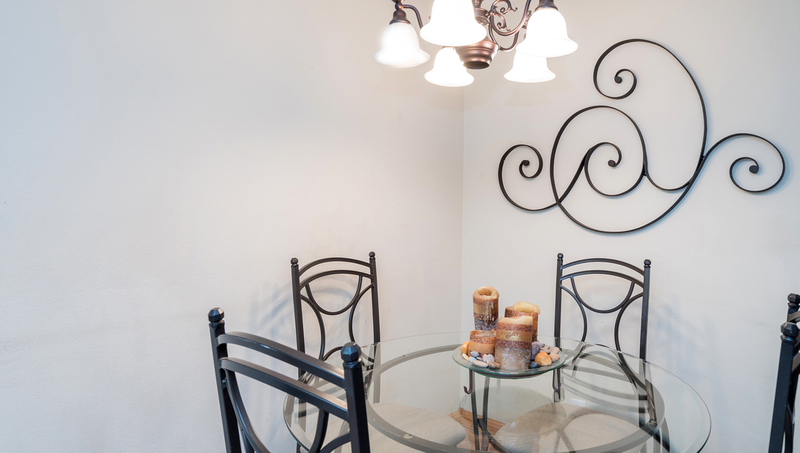 This completely remodeled condo is well equipped with all new furnishings and appliances. You enter the condo and there are stairs to the second floor directly in front of you, and the living room is to your left. The living room has a gas fireplace, sofa-sleeper, TV/VCR, DVD, and CD player, and is open to the dining area and kitchen with granite counter tops and a breakfast bar. On this floor is the second bedroom with 2 twin beds, and a hallway bathroom with a shower/tub combo. The washer/dryer is in the closet next to the full bathroom. Upstairs at the end of the hallway is the master bedroom. 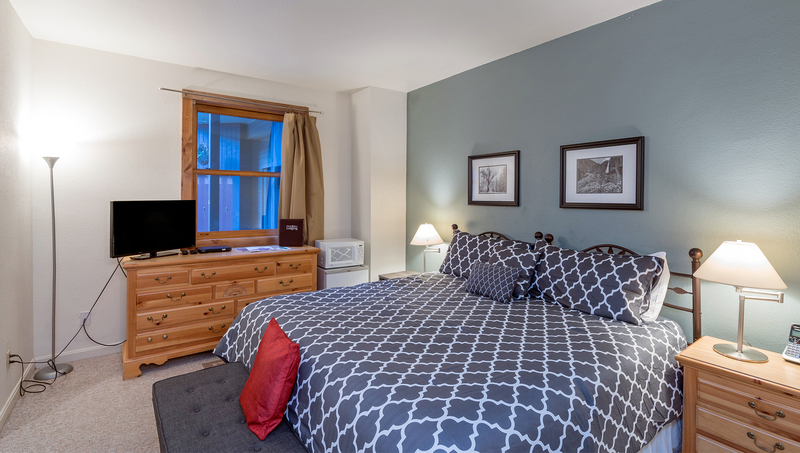 The master bedroom has a queen bed, TV w/DVD and shared bath with jetted tub and steam shower. The 3rd bedroom shares the bath and has a split king bed (can be set up as a king bed or 2 twin beds). There is a large deck off the 3rd bedroom facing the ski area and base of lift 7. Cimarron Lodge is also on the local bus route and only a few moments walk to any restaurant in town. The peaceful river walk runs along the Cimarron complex and is a lovely route to take to get to the town park for festivals. 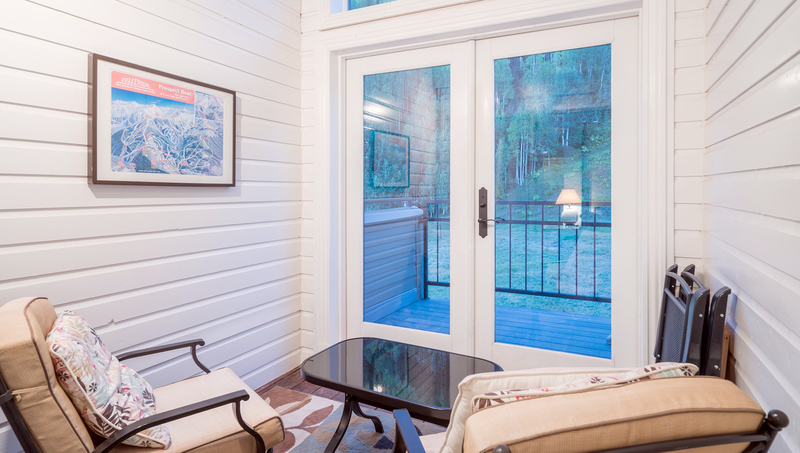 In the winter Lift 7, the Coonskin Lift, is right outside your door making this property one of the most conveniently located in the entire town. In the summer relax on the sunny deck after a day of mountain activities. There are two common outdoor hot tubs, laundry facilities and ski lockers on the ground floor of the complex. 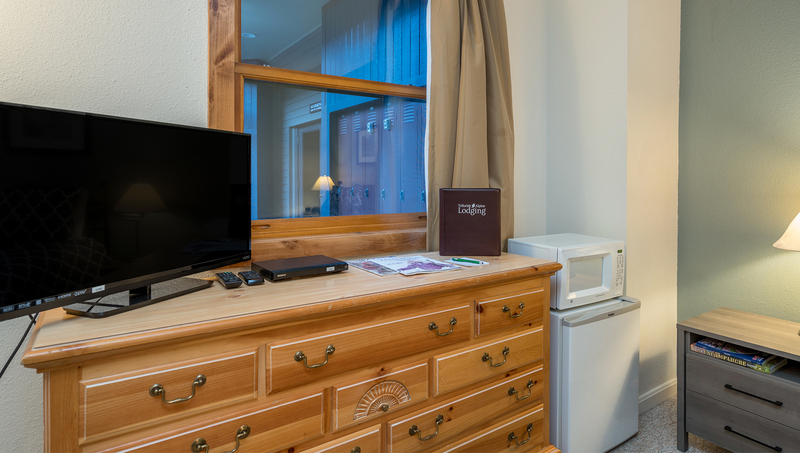 As a guest you have access to 1 private ski locker in the court yard area. Parking is in the underground parking garage at a first come, first served basis. Great for groups or families! 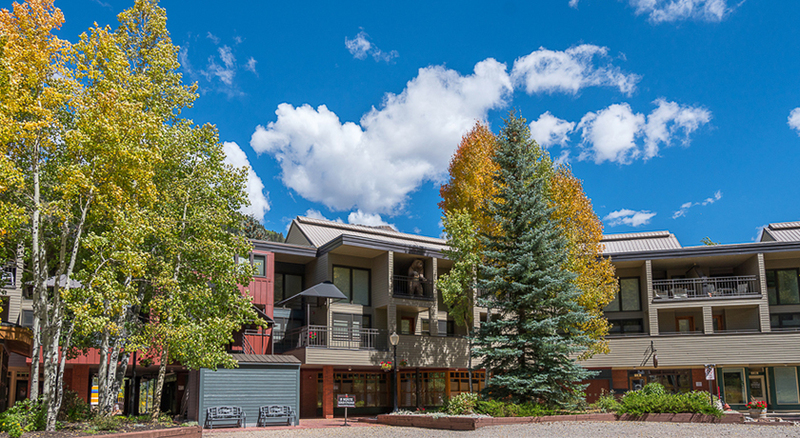 Located slopeside in the town of Telluride, this three-bedroom, three-bathroom ski-in/ski-out condo in the Cimarron Lodge is perfectly situated along the San Miguel River near Coonskin Lift #7. Bedding: King bed, queen bed, two twin beds and a queen sofa sleeper. Sleeps 8. When you walk into this second-story unit, youâ€™ll be welcomed by a two-story foyer and large living space. The living room has a flatscreen TV and a queen sleeper sofa and the space opens up to a kitchen and dining area. The kitchen has stainless steel appliances and an eat-in breakfast bar with seating in addition to a dining area with seating for four guests. There is a bedroom with two twin beds on this level, as well as a full bath in the hallway with a shower/tub combo. 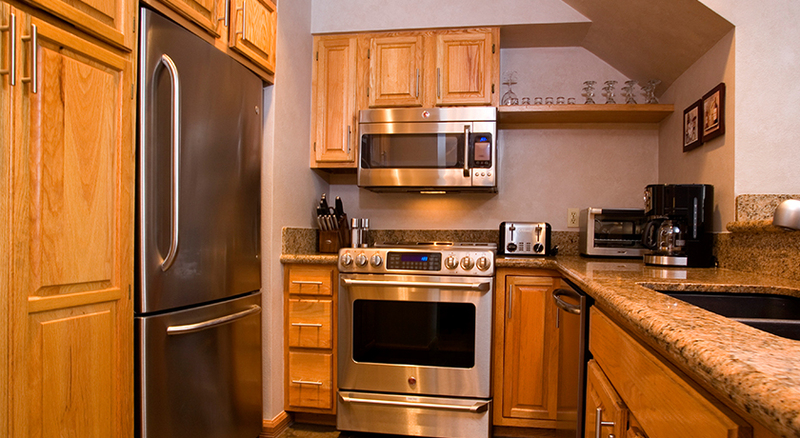 A private in-unit washer/dryer is also available on this level. 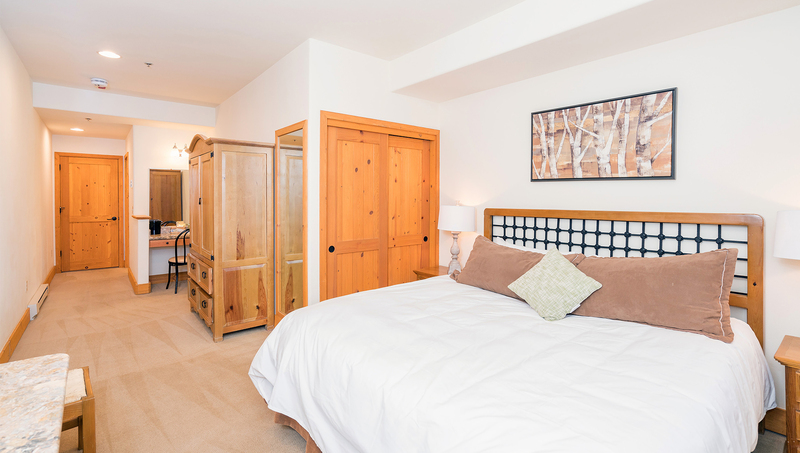 The master bedroom with a king bed and ensuite bath are located on the second floor of this Telluride condo. A third bedroom, complete with a queen bed, is also situated on this level. The third bathroom, which has a shower/tub combo, is also located on this floor. 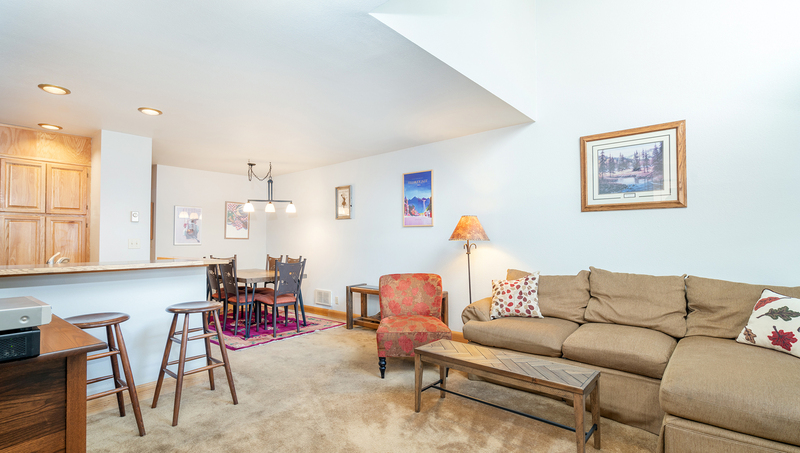 A den with a sofa and flatscreen TV also round out this roomy rental. 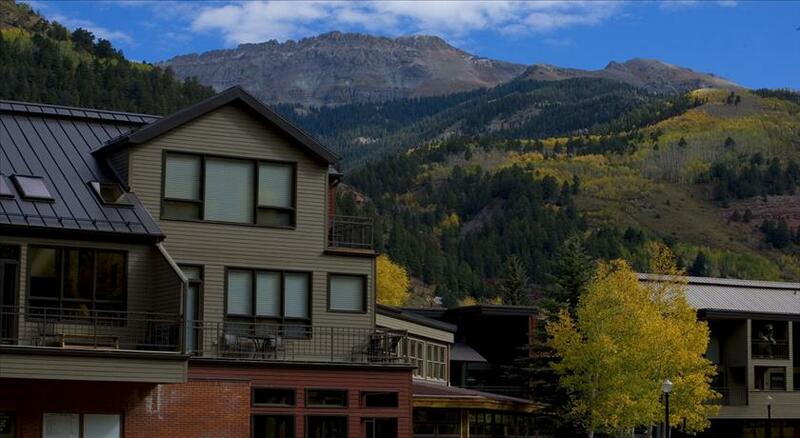 The Cimarron Lodge is a true ski-in/ski-out property in the town of Telluride with access to Lift 7 (Coonskin Lift). The building has an underground parking garage with spots available to guests on a first-come, first-served basis. 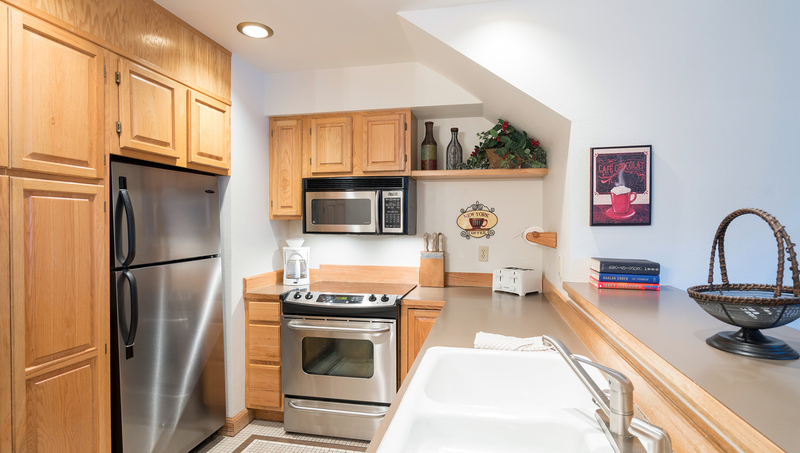 Complex amenities include two outdoor hot tubs, gas grills and this unit has access to one private ski locker. 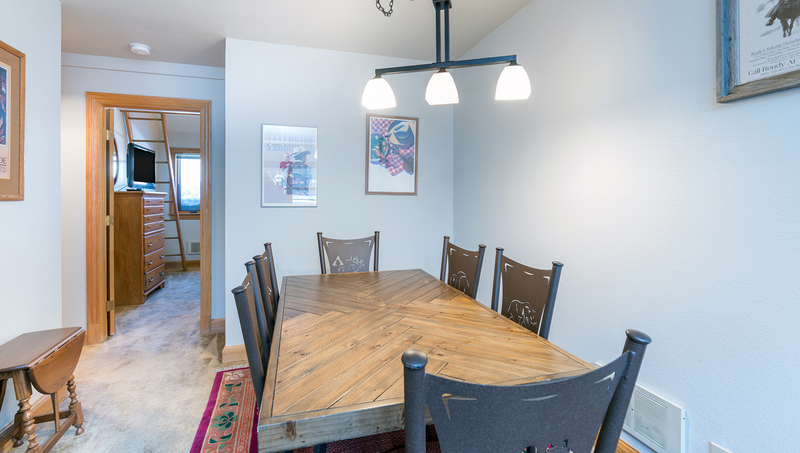 This beautifully-redone one-bedroom condo is perfect for a couple looking for an amazing place to stay in the town of Telluride. Located between the Coonskin Lift #7 and the San Miguel River, the Cimarron Lodge is a great place for both summer and winter stays. Bedding: Queen bed. Sleeps 2. Upon entering this second-floor unit, youâ€™re welcomed into a cozy updated living space complete with an open kitchen and dining space. 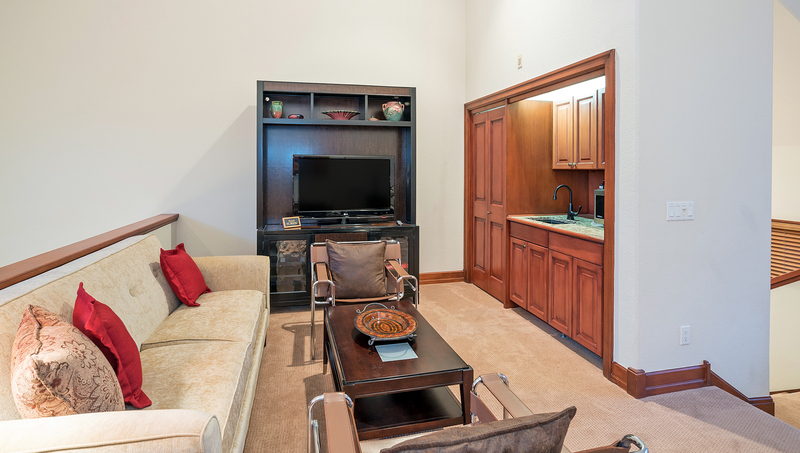 The living room has multiple comfortable seating options, a flatscreen TV, VCR, DVD and CD player. 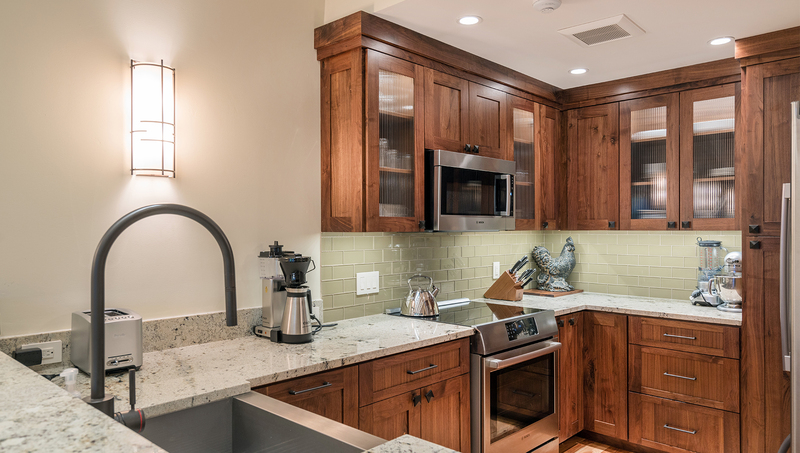 It opens up to an upgraded full kitchen with bar seating and everything you need to cook a meal. 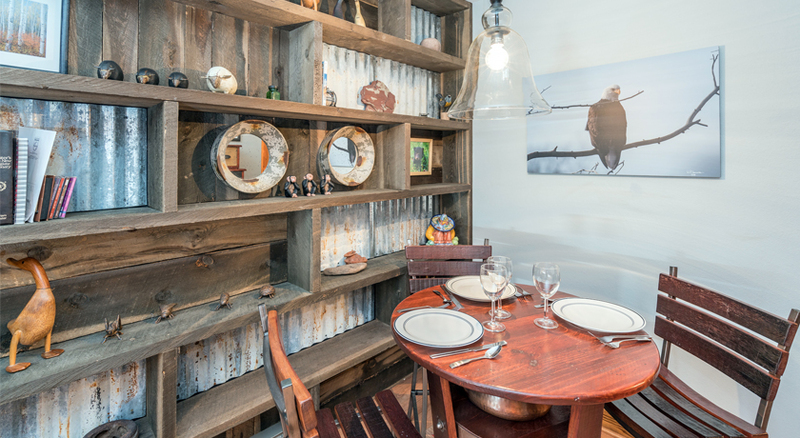 The comfortable dining area seats four and has been upgraded to include beautiful display shelving. The bedroom is truly unique! Highlighted by an amazing wood headboard, the queen-sized bed has views of the San Miguel River. The bathroom is also completely updated with finishes youâ€™ll love using after a day on the slopes or out hiking the trails. 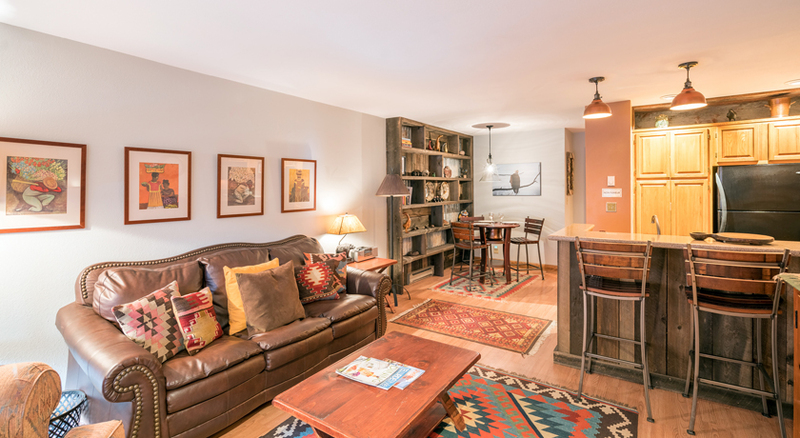 This 1-bedroom apartment is located in between the Coonskin Lift #7 and the San Miguel River, where the Cimarron Lodge is a great place for summer and winter. Bedding: Queen bed and queen sofa-sleeper. Enter the apartment from the 2nd floor outdoor walkway. In the living room is a queen sofa-sleeper, TV w/VCR and DVD, CD player. 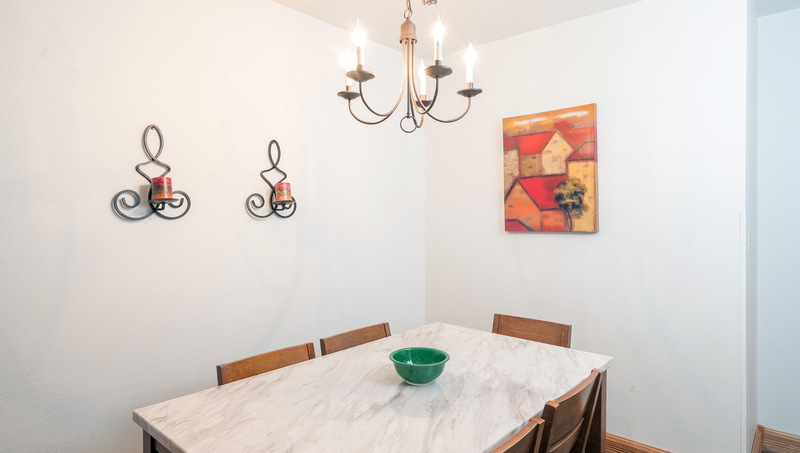 The full kitchen and dining area are open to the room. 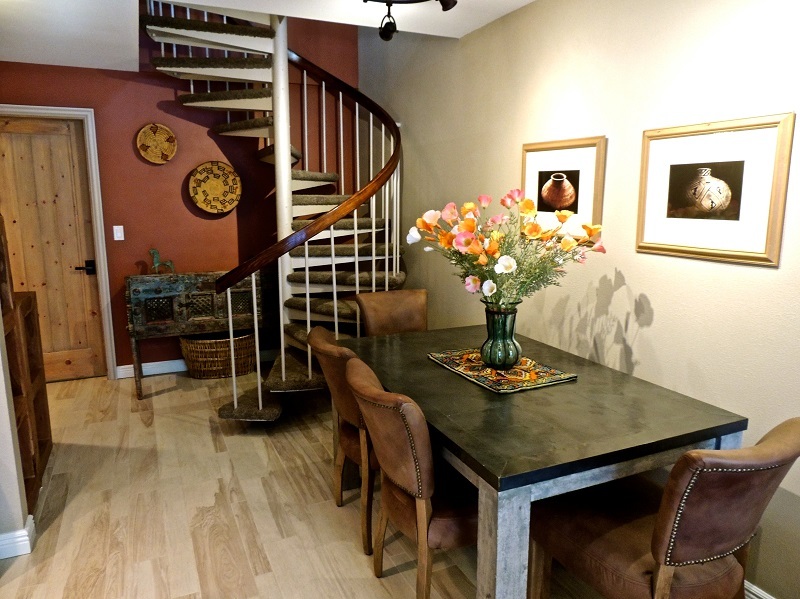 In the bedroom is a queen bed, TV, and views of the San Miguel River. The bathroom has a shower/tub combo. 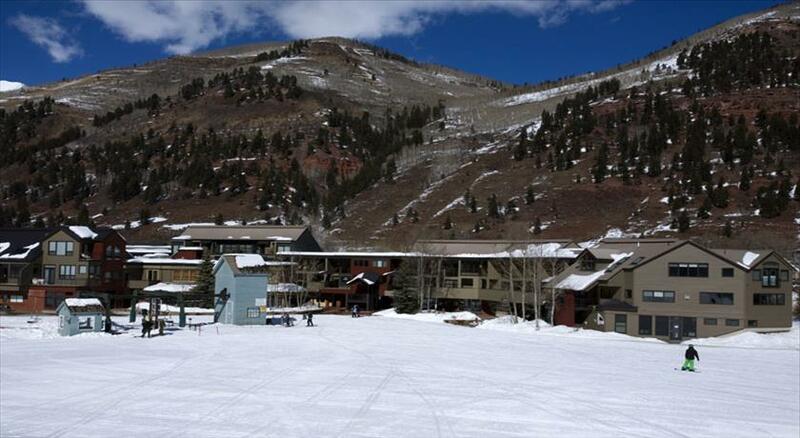 Cimarron Lodge is located at ski-in/out access to lift 7 (Coonskin lift) in Telluride. The building has an underground garage with parking on a first-come-first-serve basis(not available during peak times), two common outdoor hot tubs. Two gas grills in the common area on the ground level and coin-operated laundry facility are for residents' and lodgers' use. 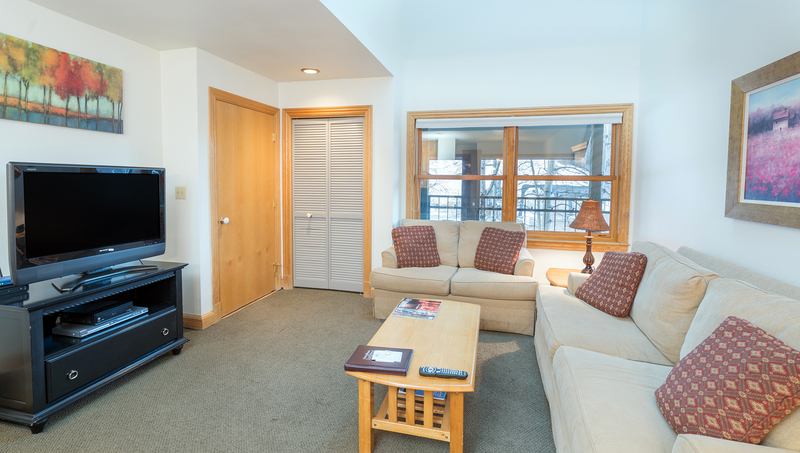 As a guest you have access to 1 private ski locker in the court yard area. And there is also a ski rental facility and a coffee shop. Ski-in/out convenience in winter and by river and river trail in summer! Bedding: Queen bed, and a queen plus double bed. 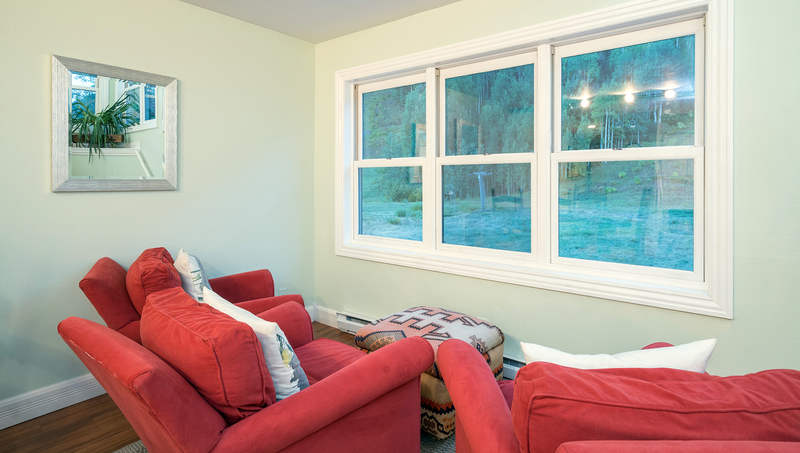 From the 2nd floor outdoor walkway, enter the living room where there is a flat screen TV w/DVD, CD player, and views of the ski hill. 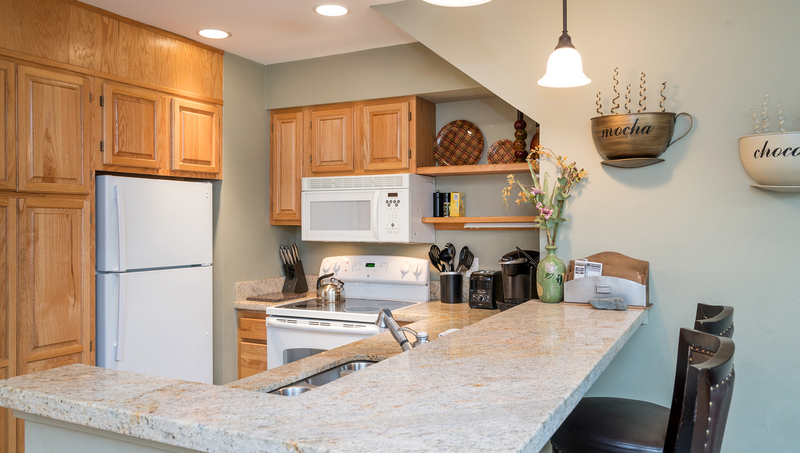 The full kitchen with breakfast bar and dining area are open to the room. 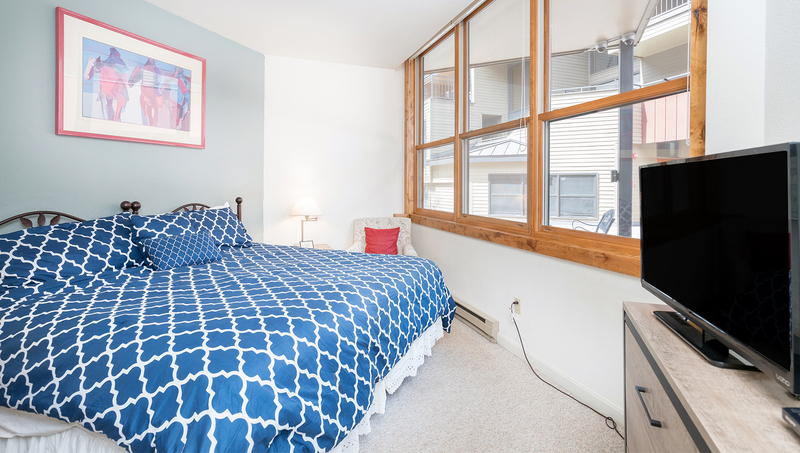 On this level is one bedroom with views toward the river, queen bed and full bathroom. 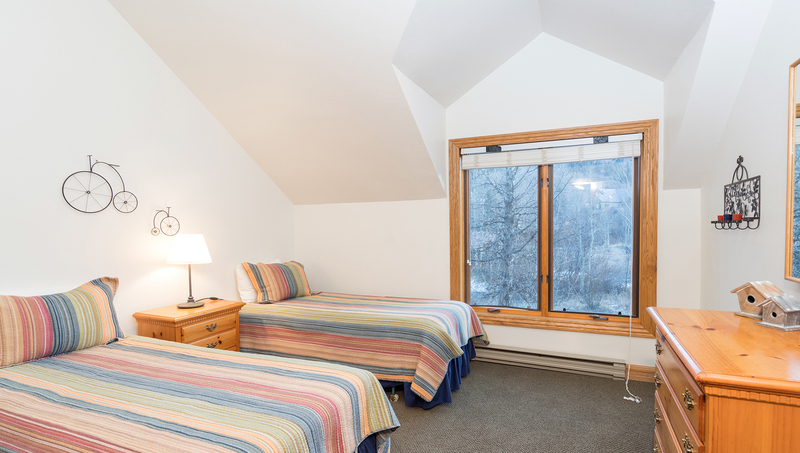 Upstairs is the master suite with a queen bed and a double bed, TV, en-suite bathroom with shower/tub combo and a great balcony overlooking the ski area and lift #7. 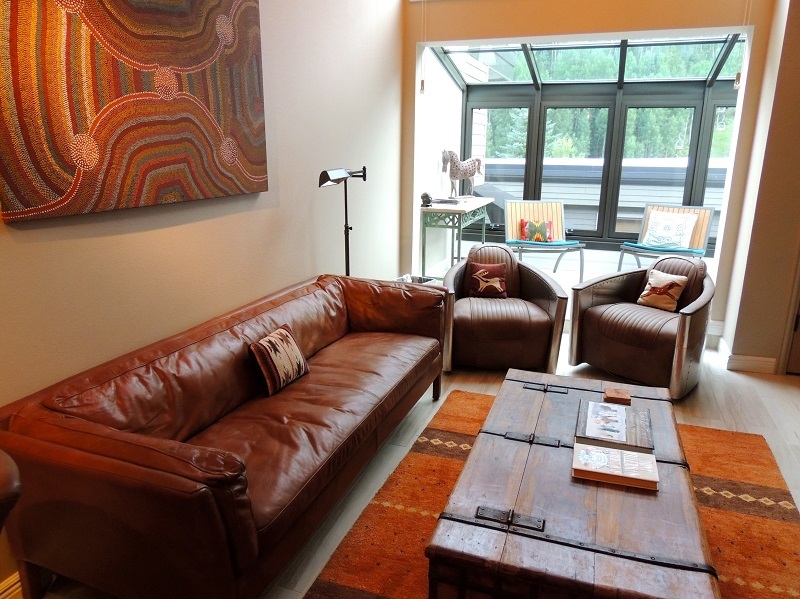 Cimarron Lodge is located with ski-in/out access to lift 7 (Coonskin lift) in Telluride. 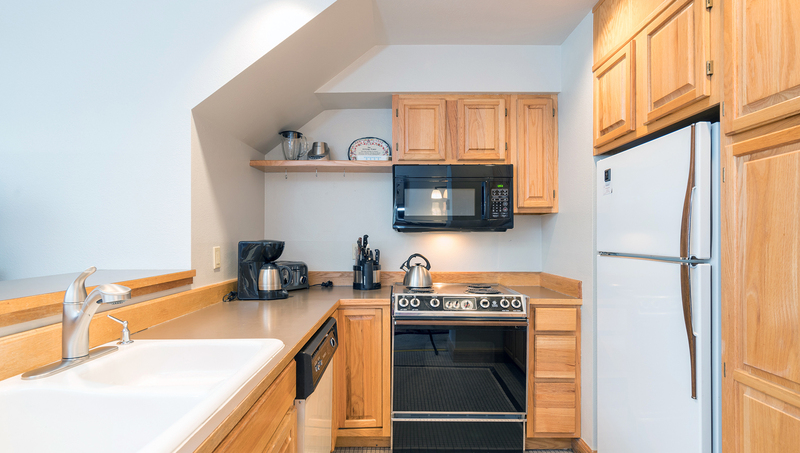 The building has an underground garage with parking available on a first-come-first-serve basis, two common outdoor hot tubs, coin-operated laundry facility, two gas grills, and there is also a ski rental facility and a coffee shop. 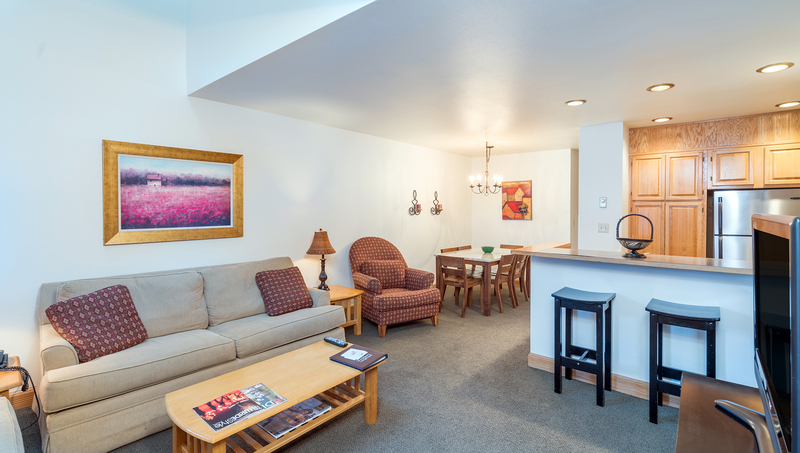 As a guest you have access to 1 private ski locker in the court yard area. This condo does not have a land line. Convenient ski-in/out location by lift #7 (Coonskin lift) in Telluride. Bedding: King bed, split king bed, queen sofa sleeper. 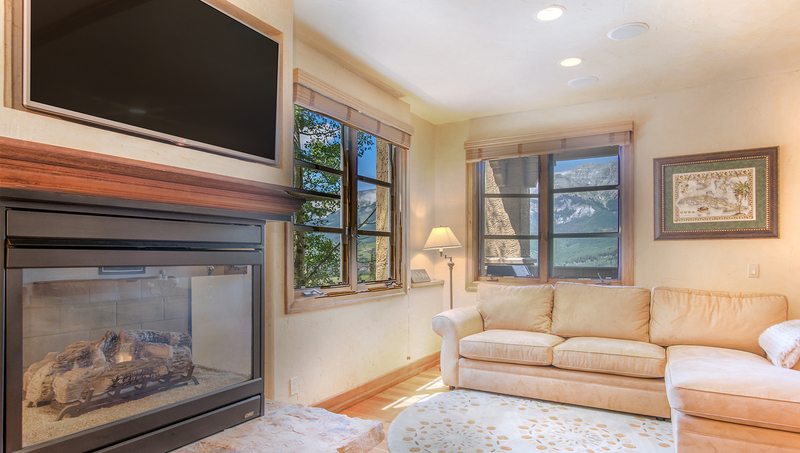 The ski in ski out location of Cimarron Lodge can not be trumped as the ski slope reaches out to the front door and your private balcony offers incredible views of the snow capped peaks. This newly furnished condo has been updated with 3 flat panel LCD TV's with a 55 inch TV in the living room. Each television is accompanied by a blu-ray DVD player. 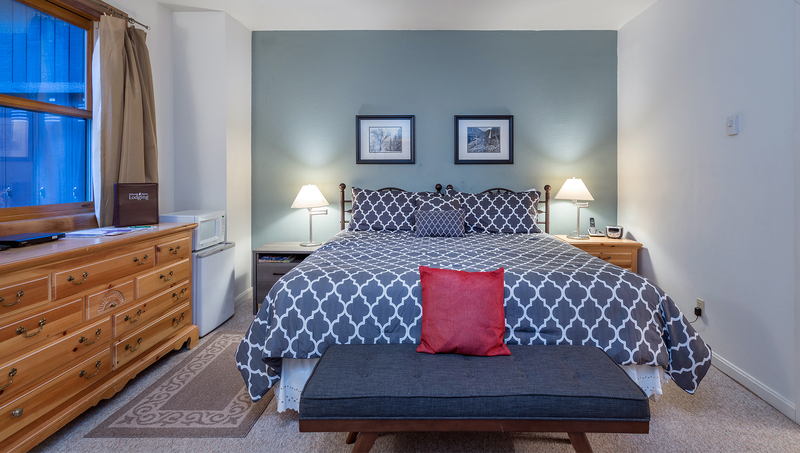 The lower level bedroom has views of the river and is furnished with two twin beds that can be converted into a king bed and a flat screen TV. There is a full bathroom in the hallway, as well as washer/dryer. For additional guests, the comfortable living room couch converts into a queen sofa sleeper. 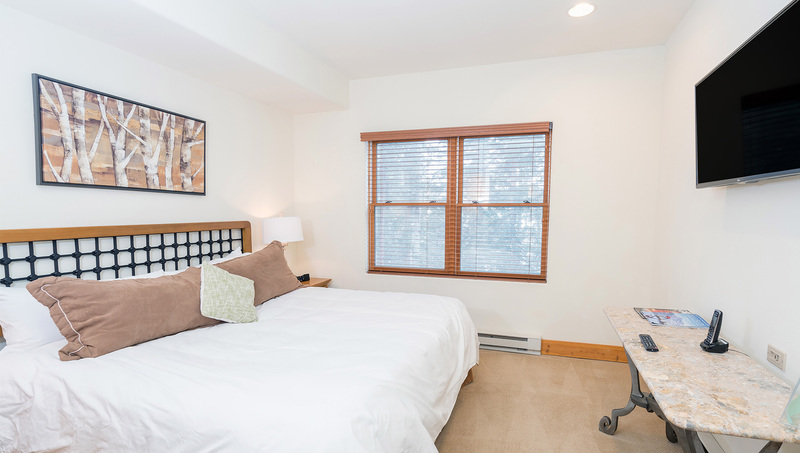 Upstairs you will find the peaceful master bedroom with a king bed, a full bath, flat screen TV and covered balcony overlooking the ski area. Cimarron Lodge is located on the local bus route and only a few moments walk to any restaurant in town. The peaceful river walk runs along the Cimarron complex and is a lovely route to take to get to the town park for festivals. 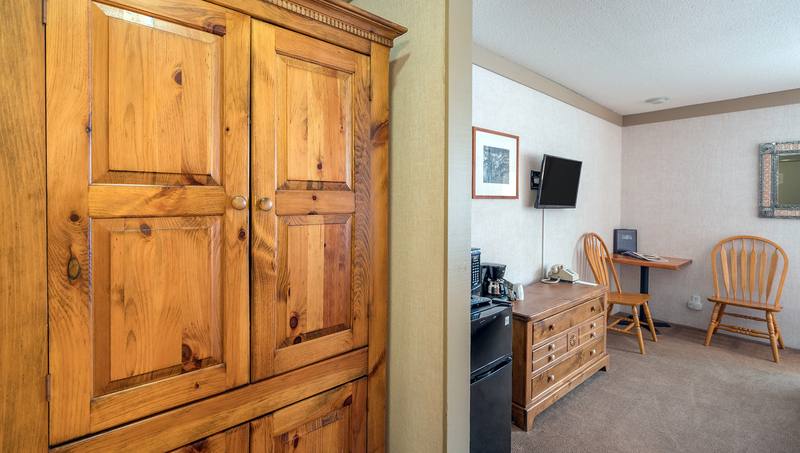 As a guest you have access to 1 private ski locker in the court yard area. There are also two outdoor hot tubs at the property as well as a garage. 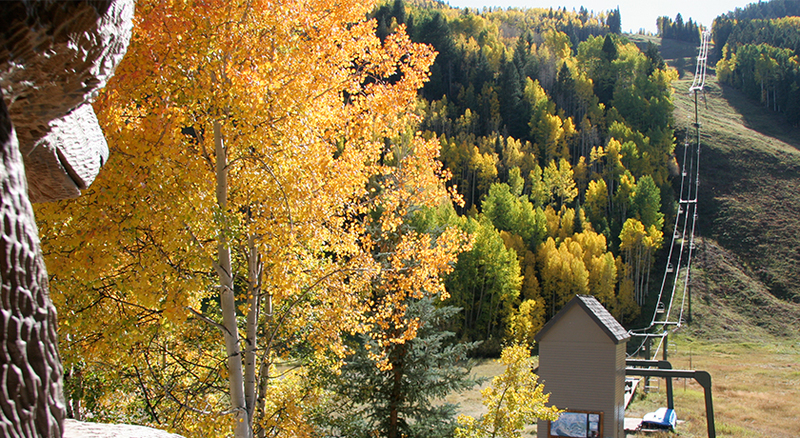 With the ski lift on one side and the San Miguel River on the other, the Cimarron Lodge is great both summer and winter. Bedding: King bed, queen bed, and queen sofa-sleeper. 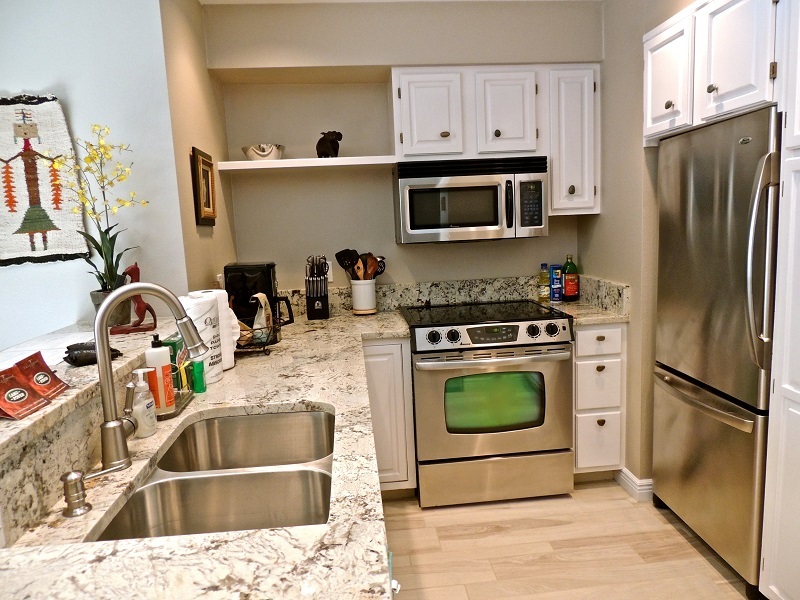 Pet-friendly condo (max. 2 pets). Entering from the 2nd floor outdoor walkway, you'll find the living room with queen sofa-sleeper, TV w/VCR and DVD, stereo with CD player. 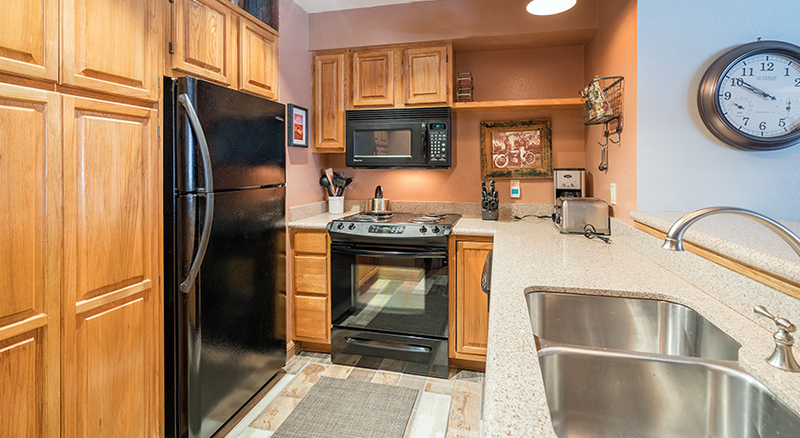 It's open to the full kitchen with breakfast bar and dining area that seats 6. Beyond the kitchen is the bedroom with queen bed and TV. There is a bathroom with shower/tub combo on this level as well. Upstairs is the master suite with king bed, TV w/VCR, and private bath with shower/tub combo. This condo also has a private washer/dryer. Outside the main entrance is the shared deck with views of the Milk Run ski run. The complex is ski-in/ski-out via Lift #7 (Coonskin Lift). 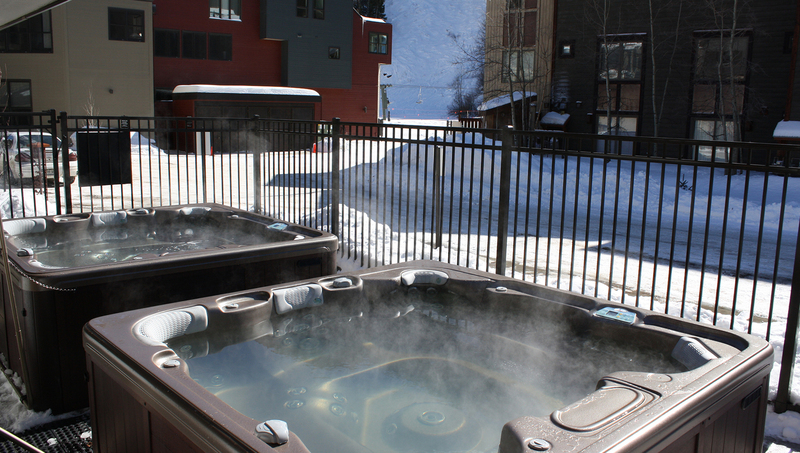 Two outdoor hot tubs are located on the ground level, where you will also find ski rental shop and coffee shop among the small businesses. Garage parking is available on a first-come/first-served basis. Not all CL units have garage remotes in the units. Some only have key to pedestrian door. If they only have garage door key, guests may go through the pedestrian door and push button beside the garage door to raise it. Gas grills are available for use in the common area ground level. As a guest you have access to 1 private ski locker in the court yard area. The free town shuttle stops at the pedestrian bridge, so you can walk or ride the 5 blocks to downtown historic Telluride. 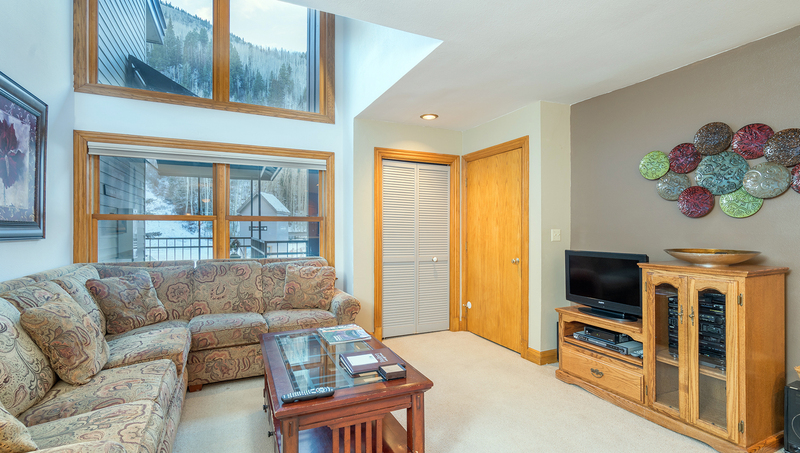 Bright and Airy Ski-In/Ski-Out Condo in Telluride - Walk Everywhere! 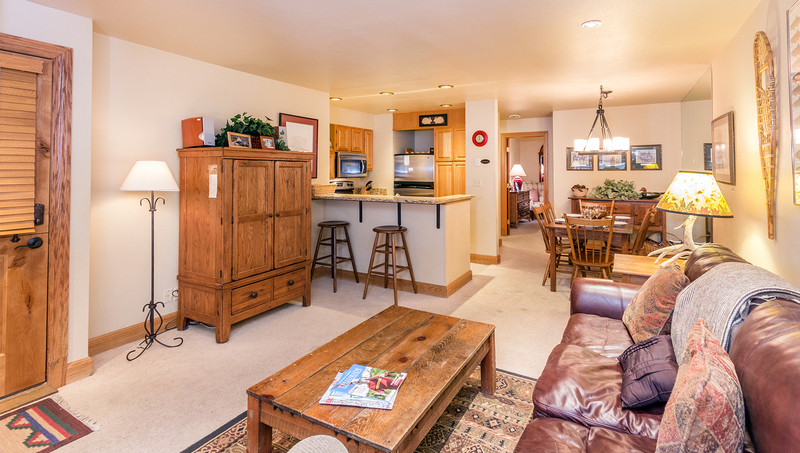 This 2-bedroom Cimarron Lodge condo not only has ski-in/ski-out convenience - it also has great views of Lower Milkrun and the ski area from its private deck! Bedding: King bed, two twin beds, queen sleeper sofa. Sleeps 6. Guests enter this condo on the second-floor exterior walkway and are welcomed into an airy, open combined living space. The living room features a queen pullout couch, flatscreen TV, DVD player, and CD player. The living area is open to the dining room and kitchen, which has seating for six between the dining table and breakfast bar. 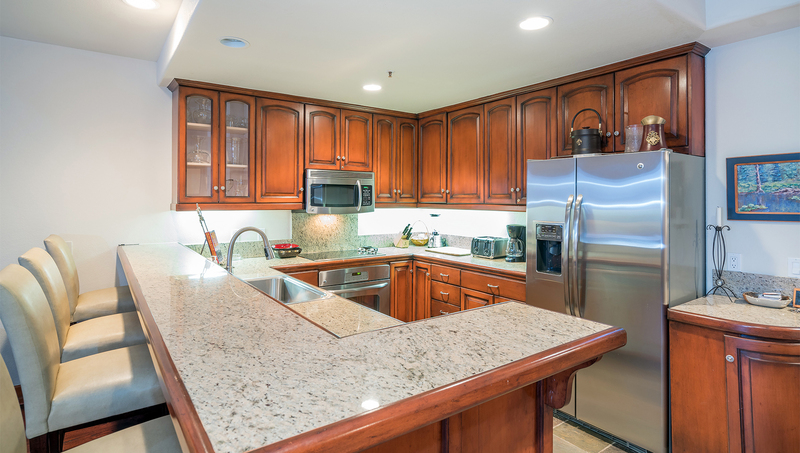 Updated granite counters, appliances and furniture add to this unitâ€™s comfort and appeal. There is a bedroom located on the first floor, complete with two twin beds and forest views. A full bathroom with a shower/tub combination is also located on this level. The master suite occupies the entire second floor of this unit. 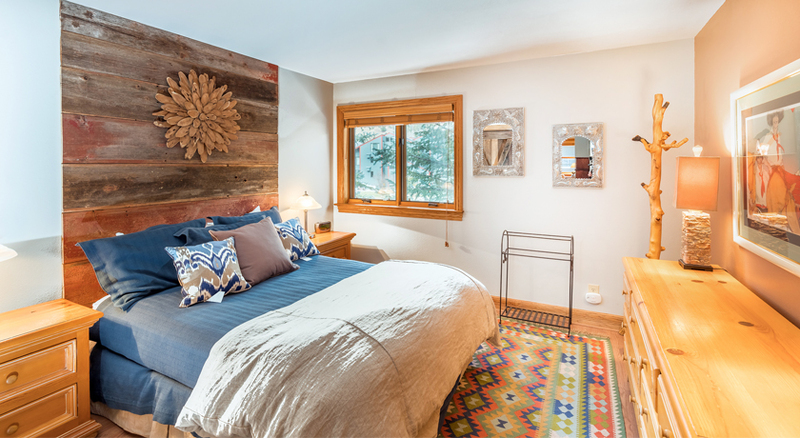 The bedroom features a king bed, TV and DVD player, vaulted ceilings and a private deck with stellar views of the ski area and the Lower Milkrun trail. The ensuite bathroom has an updated granite vanity open to the bedroom, as well as a shower/tub combo. 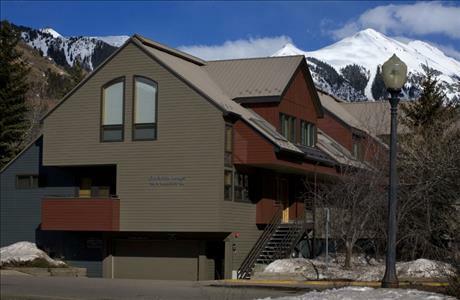 The Cimarron Lodge is located on the west end of town with ski-in/ski-out access to Lift 7 (Coonskin) in the town of Telluride. There is an underground garage with parking on a first-come, first-serve basis, as well as two common outdoor hot tubs and a coin-operated laundry facility. 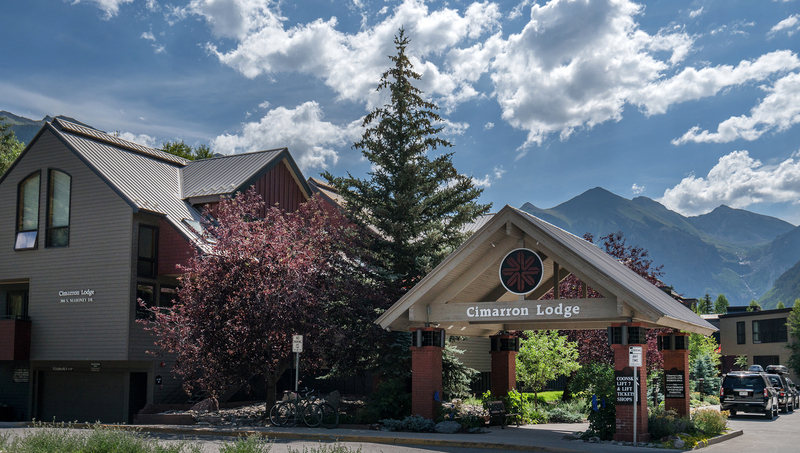 The Cimarron Lodge also has great access to everything Telluride has to offer, including restaurants, shops, the river trail, Town Park for summer festivals, and the valley floor for hiking, fly fishing and cross-country skiing. 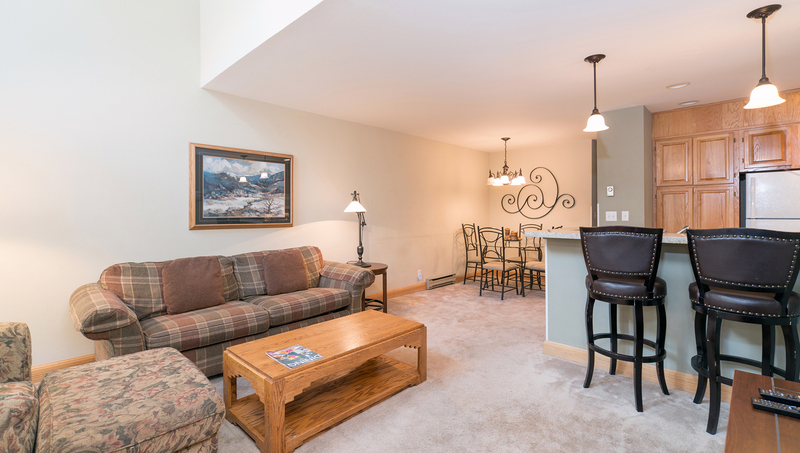 This Cimarron Lodge unit has a prime location right at the base of Lift #7 - perfect for great ski access and amazing hiking in the summer. Bedding: King bed, split king bed, and queen sofa-sleeper. 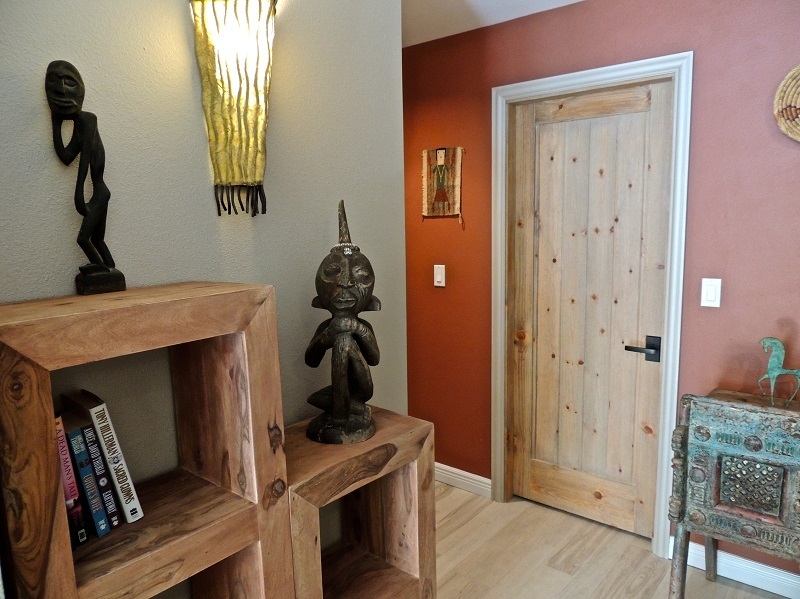 You enter this 2-bedroom unit from an exterior walkway that faces the Telluride Ski Resort. Upon entering the home, you are welcomed into a large, inviting living room with plenty of light. The living room is open to both the dining room and kitchen. 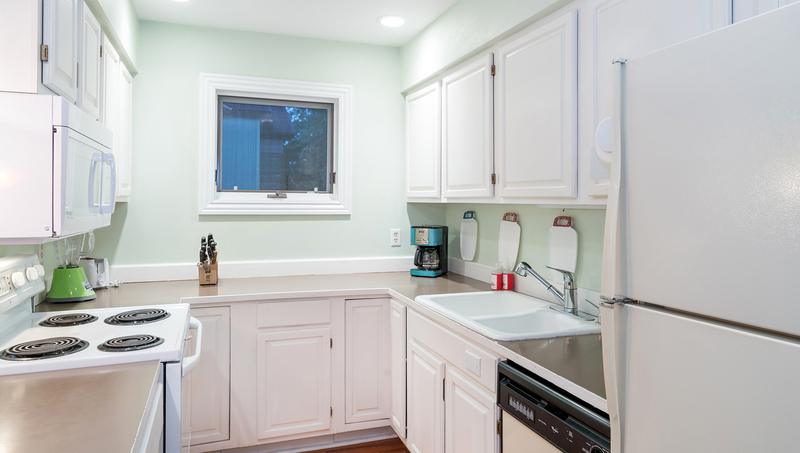 The kitchen has a breakfast bar with several stools for additional seating. *The kitchen is currently undergoing a remodel and will be completed this spring. A bedroom and bathroom are located down the hall at the back of the residence. The bedroom features a king bed and the bathroom has a shower/tub combo. On the second floor of the residence is the second bedroom, a large private master. 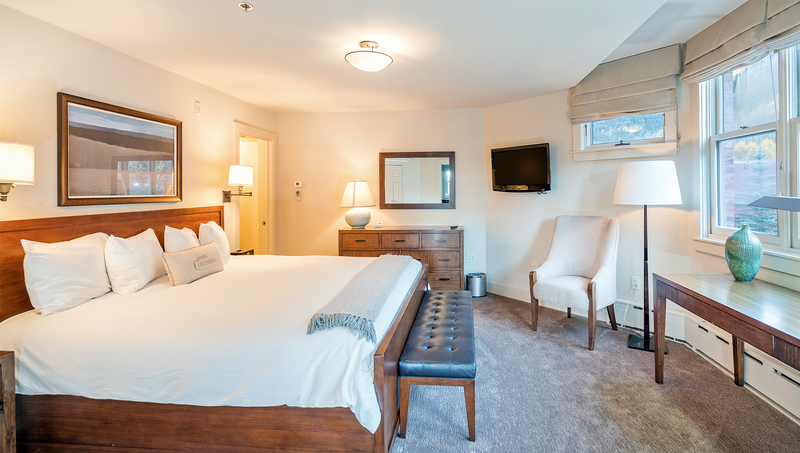 This room features a split-king bed, flat screen TV, en suite bathroom and double doors leading out to a fabulous deck. 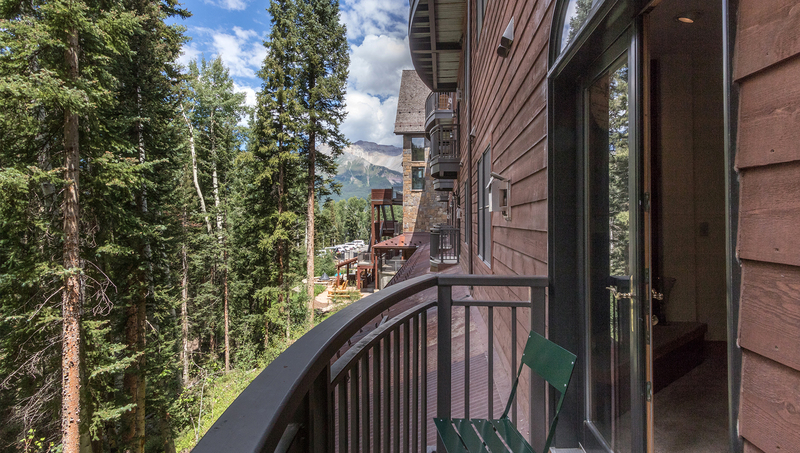 The deck has views of the Telluride Ski Resort and is a great spot during both the summer and winter. With the Coonskin Lift (#7) on one side and the San Miguel River on the other, the Cimarron Lodge is great summer and winter. Bedding: King bed and twin sofa-sleeper, two twins plus queen and a queen sofa-sleeper. Enter from the 2nd floor outdoor walkway to the living room with queen sofa-sleeper, TV w/DVD, full kitchen and dining area. Also on this level is a bedroom with 2 twin beds and a loft above (ladder access) with a queen bed. 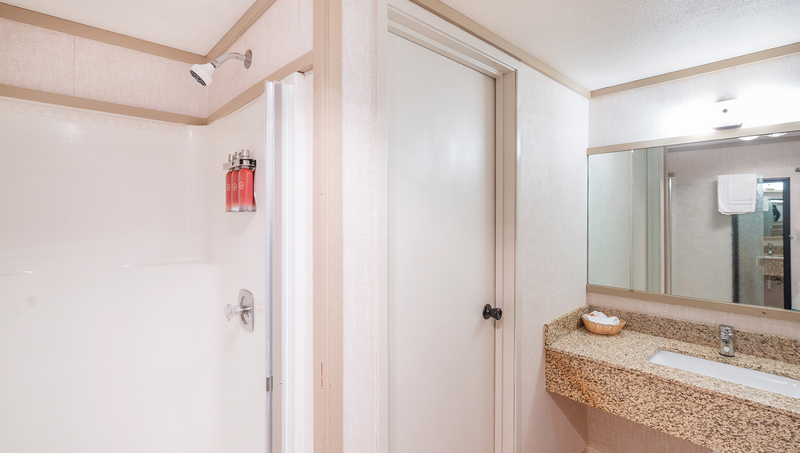 The bathroom, located in the hallway, has a shower/tub combo, and there is a washer/dryer in the unit. 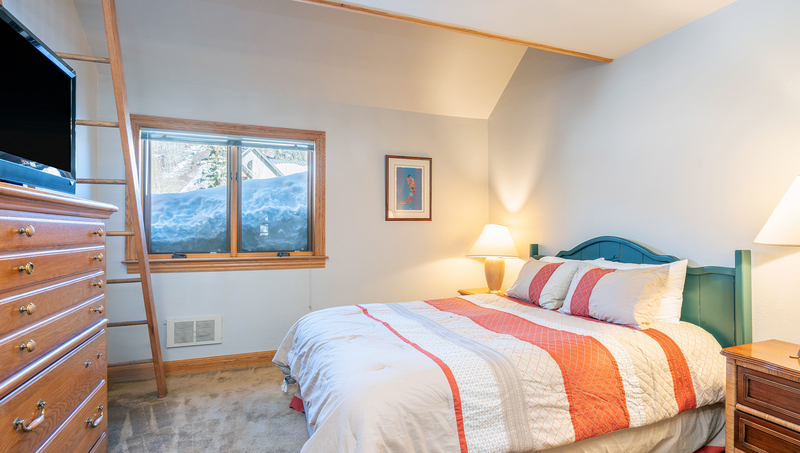 Upstairs is the master suite with king bed, a sitting area in an adjoining alcove with a twin sofa-sleeper and views of the ski runs, and full bath with shower/tub combo. 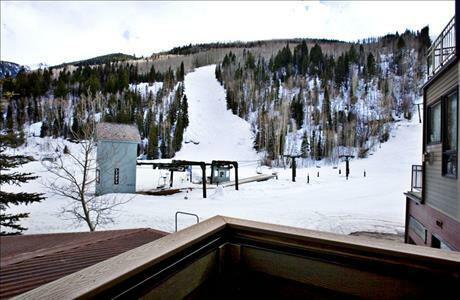 Cimarron Lodge is located at ski-in/out access to lift 7 (Coonskin lift) in Telluride. The building has an underground garage at first-come-first-serve basis, two common outdoor hot tubs and coin-operated laundry facility and there is also a ski rental facility and a coffee shop. The ski in ski out location of Cimarron Lodge can not be trumped as the ski slope reaches out to the front door and your private balcony offers incredible views of the snowcapped peaks. 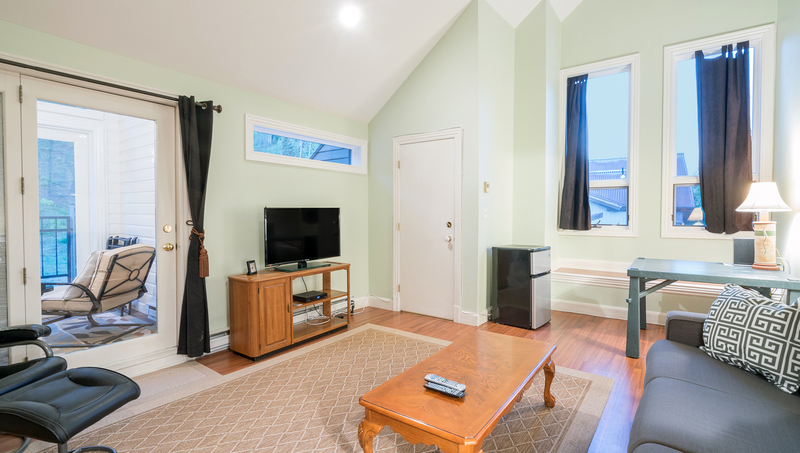 This sunny, end unit condo has a spacious living room with flat screen TV, full kitchen, two bedrooms and two full baths. 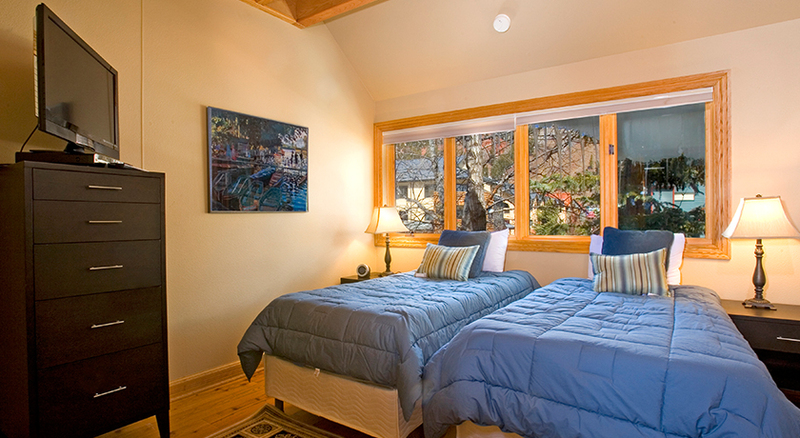 The lower level bedroom has views of the river and is furnished with two twins that can be converted into a king bed. Upstairs you will find a large master bedroom with a king bed, flat screen TV and a sofa sleeper in the nook, as well as a full bath. Cimarron Lodge is located on the local bus route and only a few moments walk to any restaurant in town. The peaceful river walk runs along the Cimarron complex and is a lovely route to take to get to the town park for festivals. As a guest you have access to 1 private ski locker in the court yard area. There are also two outdoor hot tubs at the property as well as an underground garage. 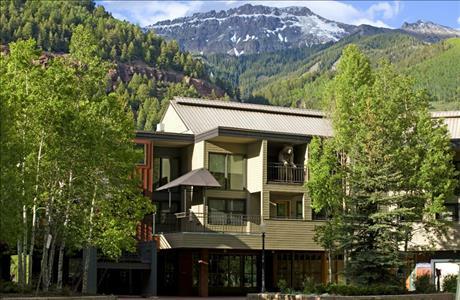 Cimarron Lodge is conveniently located at easy ski-in/out access to lift 7 (Coonskin lift) in Telluride. Walk downtown for restaurants, shops and the free gondola. Bedding: king bed, split king bed (can be set up as king bed or 2 twins) and queen sleeper sofa. Enter this condo on the south side of the building. 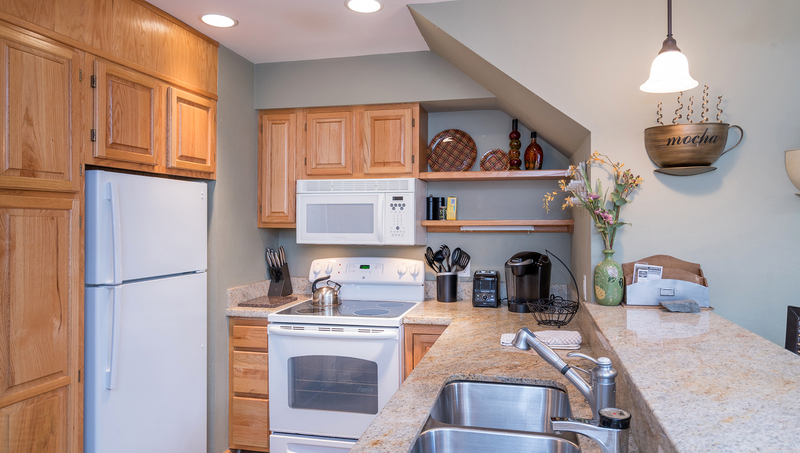 This condo is located on the second and top floor overlooking lift 7. 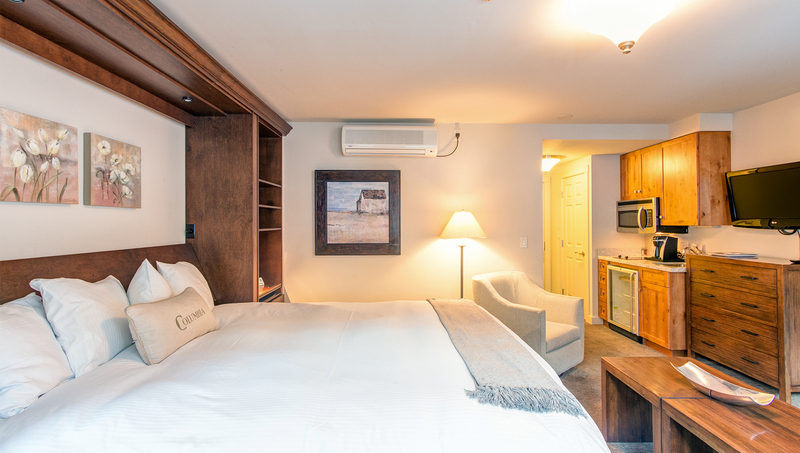 To your right after entering the condo is the second bedroom and bathroom with a split king bed. This level is fully ADA accessible. The kitchen and living room are also on this level. Upstairs is the master bedroom with a king bed as well as a walk-in closet and master bathroom. 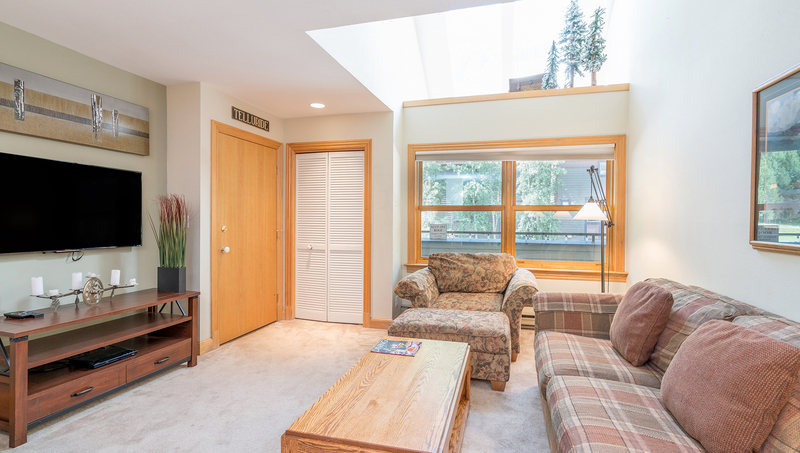 Adjacent is a sitting area with flat screen TV and sleeper sofa as well as a sun room and deck overlooking lift 7! 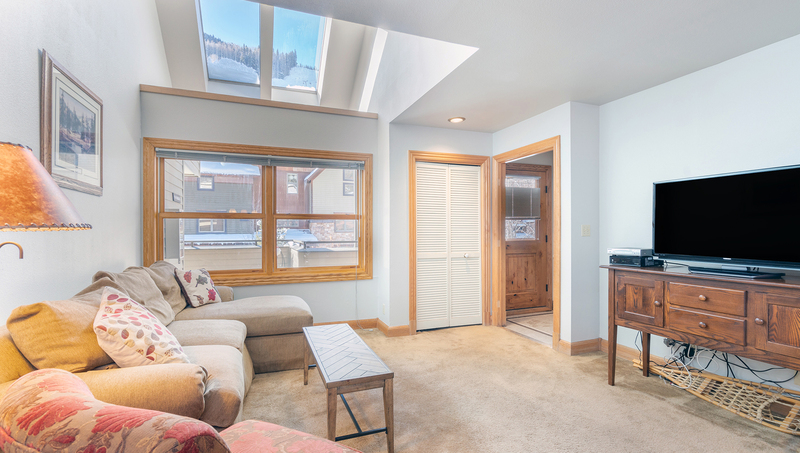 Cimarron Lodge is conveniently located at easy ski-in/out access to lift 7 (Coonskin lift) in Telluride. The building has an underground garage with parking on a first-come-first-serve basis, two common outdoor hot tubs and coin-operated laundry facility. 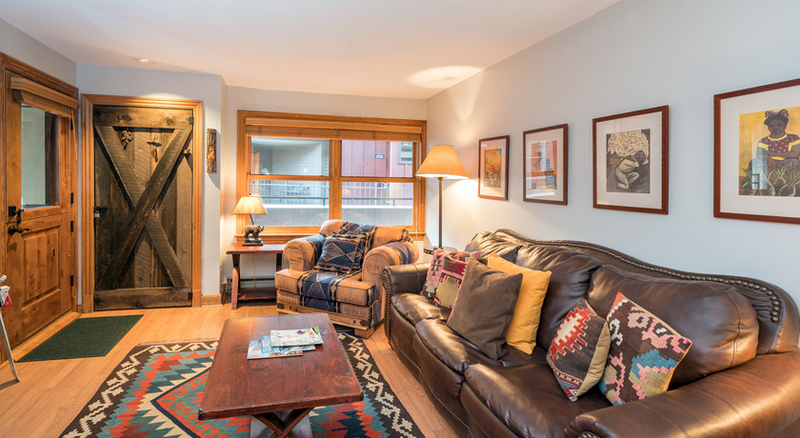 Nestled between Coonskin Lift #7 and the San Miguel River is this comfortable two-bedroom, two-bathroom condo in the Cimarron Lodge. Bedding: Queen bed, two twin beds and queen sofa sleeper. Sleeps six. 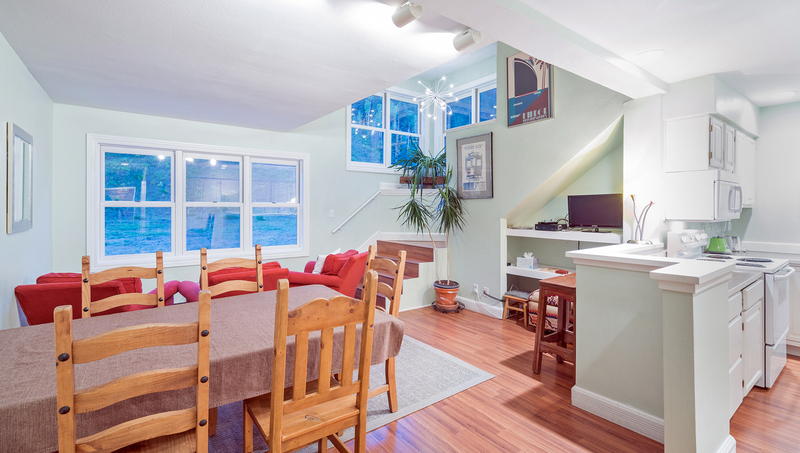 This condo is on the second floor and has view of the Milk Run ski run and Lift #7. 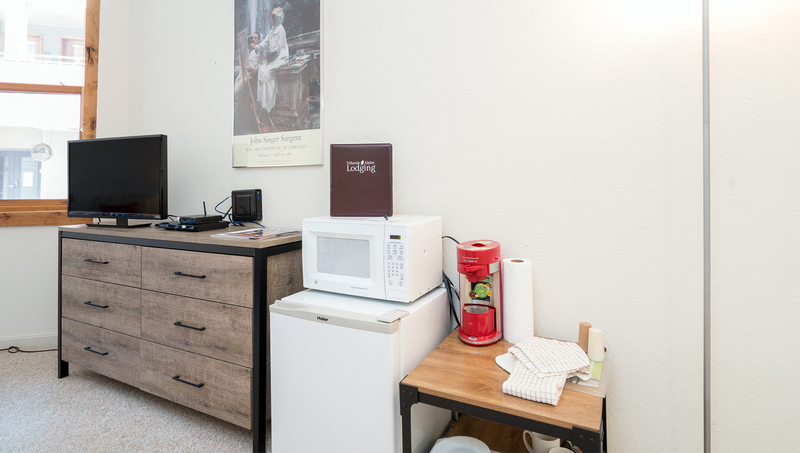 Guests enter from an outdoor walkway into the unit, which has a large, open living space that includes a living room, dining area and kitchen with a breakfast bar. The living room has a queen sofa sleeper and a large flat screen TV with a DVD player, while the dining room seats up to six. 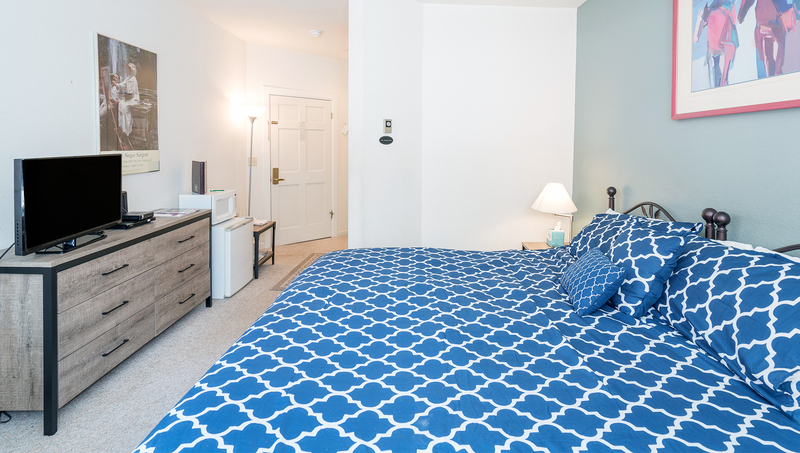 The first floor of this unit also has a bedroom with two twin beds, a full bathroom with a shower/tub combo and in-unit stackable laundry. Upstairs is the master bedroom and full ensuite bathroom with a shower/tub combo. 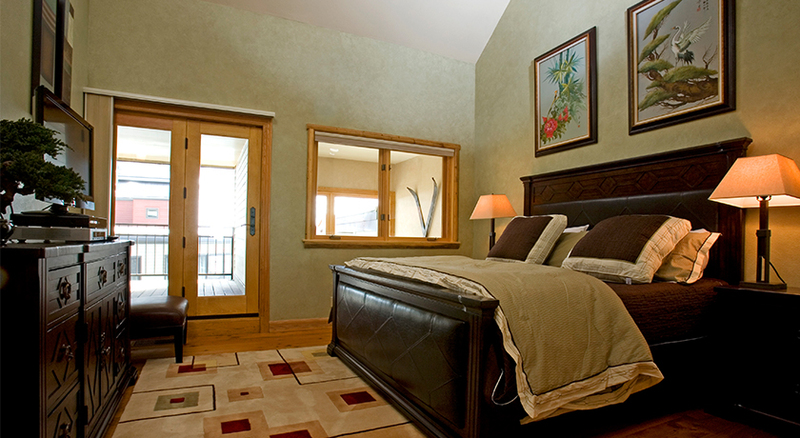 The second bedroom also features an enclosed deck with views of the ski hills.